Today Shane and I ventured out on a lovely "Sunday Road Trip". We didn't have anywhere in particular we wanted to go, we just decided to get in the car and drive. 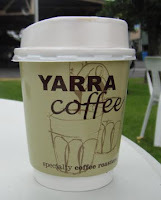 The first place we found ourselves was a small farmers market in Yarra Glen. 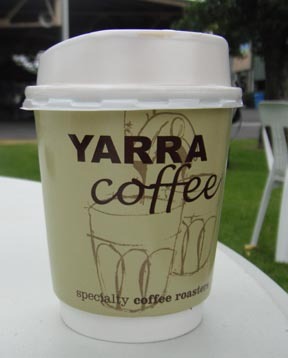 Shane got his nice hot coffee and we bought the tastiest cherry's I have ever had. ﻿Where to next - we then drove up through Healesville but there were just way to many people. On the road again we drove up through the "Black Spur" which is such a beautiful area to drive through. Two years ago when Victoria went through it's devastating bush fires the "Black Spur" was one of the areas that was hit. 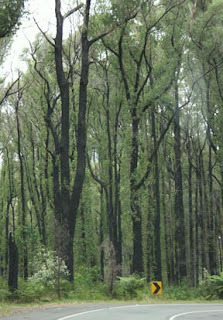 The landscape is now quite amazing with the trunks still blackened and the fresh green shoots seemingly just poking out the sides. 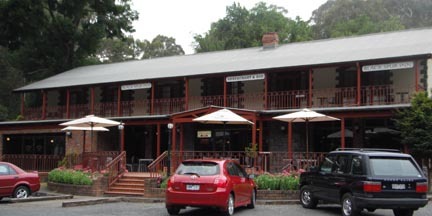 Lunch was next on the agenda, so we stopped of at the "Black Spur Inn" which is in a small township called Narbethong. For our return trip home we decided to make our road trip a circle rather than back track. So it was onto Alexandra, then Yea and just before we got back home we stopped of at Sugarloaf Reserve to check how much the water has risen since we were last there. 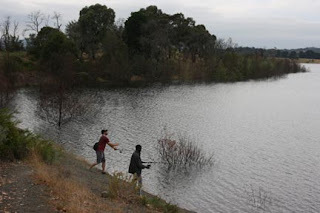 Sugarloaf is a very popular waterway for recreational fishing and the first five minutes we were there a young boy and his Dad caught three Yellow Belly Fish. 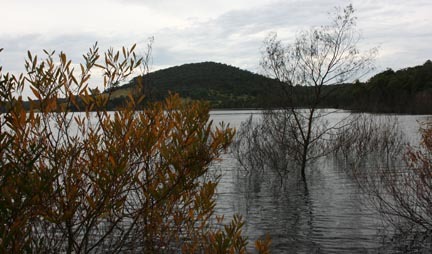 Sugarloaf is also one of the major water catchments that provide Melbourne with it's water. The last time we went to Sugarloaf Reserve was when we took my dear old Dad there and we sat and ate fish & chips for lunch. I was amazed how much the water had risen I would say probably about 20 metres. Now back home I am a bit tired but have really enjoyed a great Sunday. I love Farmers Markets...great pics of your day! The trees in Black Spur are beautiful. It sounds like a lovely trip. Now that you're home, put your feet up and relax. Thanks girls - yes it certainly was a lovely way to spend a Sunday.